SHUYUD PLOV is a pilaf that is always made with dill, but prepared differently in different regions of Azerbaijan. For example, in Karabakh, instead of putting qazmaq (a crust made at the bottom of the pan when the rice is steamed) under the rice, they put lamb brisket or boneless leg and spread raw eggs on top of the rice, which are baked right into it. In some regions, they put chicken underneath the rice, and in others, they make this pilaf without meat or chicken, but with egg. There are also variations of this pilaf with fish. Lankarani-style Shuyud Pilaf is made with lamb shanks. Preparing the lamb and dill. Rinse the shanks with cool water and place them in a pot. Cover with 2 quarts of water and bring it to a boil. As it comes to a boil, skim the foam off. Place the onion into the pot and add salt. Reduce heat to low and simmer the lamb until the meat is cooked. Remove the lamb from the broth and set aside. Wash the dill and pat it dry with a towel to remove any extra water before cooking, then chop it, but not too finely. Rinse the rice thoroughly in cold water several times to remove excess starch. Then, soak the rice overnight in salty, room temperature water for a truly great, fluffy, and tender pilaf. If you are using extra long, high quality Basmati rice and don’t have time to soak it, you can skip that step and just rinse it prior to cooking it. Alternatively, you can soak it for an hour in very hot salted water. Strain the lamb broth into a saucepan (or saucepot) and bring it to a boil. Before cooking the rice, pour out the water straining the rice with a colander. Тhen add the rice to the broth, stir, lower the heat to medium, and let it cook for 7-10 minutes. Do not overcook your rice, it must be a firm on the inside and soft on outside. Strain the rice using a colander and taste it. If it’s too salty, rinse it with hot water to wash out any extra salt. Place the rice into a large bowl, add the chopped dill and melted hot butter, and gently mix them together. First, prepare the qazmaq – crispy delicious golden crust on the bottom of the pan, underneath the rice, which will also prevent the rice from scorching. Mix together qazmaq ingredients and add ½ teaspoon of saffron infusion. Melt two tablespoons of butter in a saucepan and spread the qazmaq mixture on the butter. Cook covered on very low heat until the mixture is just lightly firm. Place the rice on the qazmaq, and pour saffron infusion on top. Make some holes in the rice with the handle of a wooden spoon to allow steam to escape and place the cooked lamb shanks on top. Wrap the lid of the pot in a tea towel or two sheets of strong paper towels (it will help absorb the steam) and cover the rice. Cook over low heat for about one hour, or until your rice is tender. 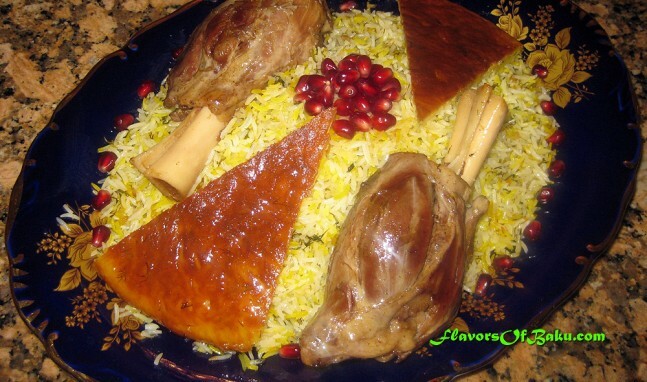 Alternatively, you can place the lamb on the qazmaq, underneath the rice. Serve Shuyud Plov on a large plate and garnish with the lamb shanks, qazmaq, and pomegranate seeds.